Our Family Fun Day workshop uses short performance, songs and games to encourage family bonding, interaction between children and adults and to help develop skills such as co-ordination, concentration and motor skills. 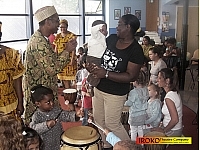 The workshop uses short performance, hands-on drumming, rhythm and rhyme, movements, songs and games to encourage family bonding and interaction between children and adults and to help develop the motor skills, coordination, listening and concentration skills of participants. Assisted by our experienced workshop leaders and held in a friendly environment, the workshop enables children to experiments with sounds as part of their early years’ music-making experience. The fun-filled workshop is not just for the children. Through it, we aim to help parents and those working with the very young understand how our innovative and fun teaching methods can be integrated into children’s overall education.